Thanks to @drinkginandbake for this Weird & Wonderful creation! 1. In a bowl, pop the raspberries, gin and 1 tbsp of caster sugar. 2. Gently stir and allow to soften for 2 hours. 3. After 2 hours, drain the raspberries keeping the remaining liquid (you'll need it later!). Leave a few raspberries in the sieve pushing them through with a wooden spoon into the gin mix. 4. Lay out 4 glasses, dip your sponge fingers into the gin and layer into your glasses (make sure they are evenly soaked). 5. Allow to soak for 10mins while you whip the cream. 6. Pop the cream, vanilla and icing sugar in a bowl and whisk until thickened and just about holding shape. 7. Soften the cream cheese using the back of the wooden spoon and fold into the cream. 8. 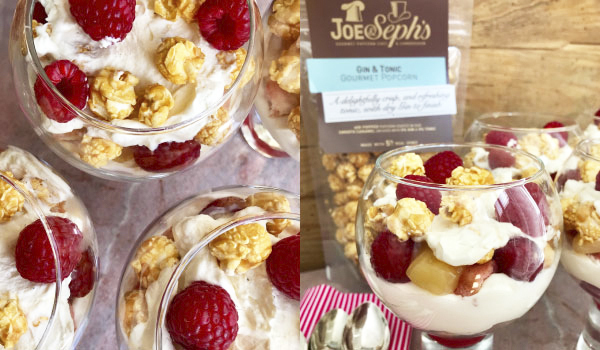 On top of the sponge fingers, add a few of the gin-soaked raspberries, a couple of little dollops of the curd, a few Joe & Seph’s Gin & Tonic Popcorn kernels, then a spoonful of cream. 9. Continue layering the process until you’ve used up all your mixture. 10. Serve immediately so the popcorn still has a delicious crunch!